When it comes to tablets, these tend to be rather fragile – however, this does not mean that there are no parties out there that do happen to work on a tougher or more rugged model. GammaTech Computer Corp. has come up with their fair share of tough devices in the past, including the Durabook TA10 tablet, and this time around, it would also be another tablet of theirs that will grace the headlines – where it would be the Durabook R11 in play. What makes the Durabook R11 stand out from the rest of the crowd? For starters, it happens to be the lightest and thinnest unit in its class, tipping the scales at a relatively lightweight 2.73 pounds, and will arrive in not one, two, or even three, but a quartet of separate bundled configurations. Sporting a vivid 11.6″ widescreen display alongside the relevant certification to stringent MIL-STD-810G, MIL-STD- 461F, and IP65 specifications, these units happen to be the ideal match for even the most demanding requirements as well as harshest environments that utility workers come across in their day to day jobs. 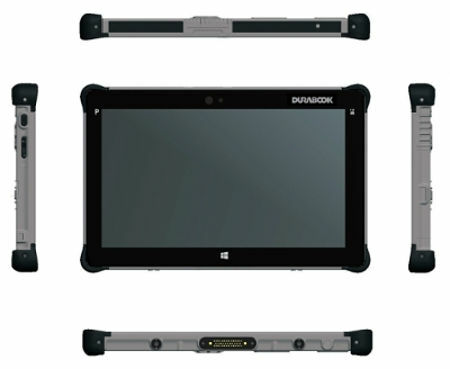 The Durabook R11 has been survival tested in order to have it withstand the daily dose of drops, bumpy roads, moisture, and dust that are normally not too far removed from utility projects. Its MIL-STD-810G rating will make sure that shock, drop, and vibration protection come with each unit, not to mention the ability to withstand use in a wide range of temperatures. Passage of the strict MIL-STD-461F for electromagnetic compatibility would enable the unit to be confidently used in a variety of endeavors, and that would include aircraft or space-system applications. Its also has IP65 rating that ensures the unit will remain sealed tight from damaging water and dust intrusion. Each purchase will arrive with a 3 year warranty, and the standard configuration will cost $2199 a pop, whereas other configurations that include a smart card reader with high speed data communications will cost $2,399, whereas throwing in all that with 4G LTE and GPS alongside a faster processor is even more expensive at $2,699. The cream of the crop would be the $2,999 model that has all of the above mentioned with a 4th generation Intel Haswell Core i7 processor.